Such a sick weekend. With the US Open in hiatus since 2011, we knew the inaugural year would be one to be at. Holy hell did it deliver. You never know what to expect when an event of this caliber takes a leave of absence only to mount a comeback some 6 years down the line. Is the team for success in place? Will the vibe be there? What racers will show? Will the vendors and event experience be crowd friendly? It’s a real tall order to pull off, not to mention, running it all in a timely fashion. No doubt about it, Clay Harper and the crew absolutely killed it. Everything from media presence and vendors, to the daily schedule, to the way the event was run from top to bottom….this is how you bring an iconic race series back. Big thanks and many props to Clay and the team. And thanks also to Hugh Reynolds. A great help and a super nice guy to interface with. Looking forward to next year you guys! First race just me and him. Wasn’t racing and he was so stoked. So was I. Shoved off Friday around 11am. We made it just in time for the whip-off. Met up with Brigandi and off we went. On Our Way to the Open. This thing was bananas. It all happened so fast. Don’t get me wrong, it was a long enough contest. This thing was sensory overload and time flew by. We met with Justin and rode the lift up. Walked down to the jump and went right to the middle top. Whip off! Burger shooting us. Once riders started popping off, they just keep popping off the lip like fireworks in the sky. Kits of every color, bright bikes, big bikes, side-ways bikes. They were buzzing our head we were that close. As I took the camera from Dre to shoot some good photos, I took a look at what he was shooting and he had almost every rider timed perfect. Handed him back the camera and he shot the rest of the whip-off. Everything you see here is courtesy of a 6 year old wielding a Nikon D3000. So Jeremy was riding the whip off just like almost everyone else. He flew over our heads once or twice, then decide to see what it was like to nose in at mach-90. Not going to lie. It was super scary to watch. As soon as he crashed, two more came in right behind him. One tore his knee apart, requiring a reconstruction and the other fractured his neck. Healing vibes to all. Jeremy walked away. Tiny black eye and a some contusions. Crazy amazing for him to walk away like that. He tucked his head and rolled to his side at the last second. It saved him for sure. He took it easy the rest of the weekend. No practice or racing for him but he was there spectating and it was fun to have him around for the rest of the weekend. Glad you are OK J! We set up across from Defiant Racing and next to KHS. Amy rolled in and started to practice. Everyone was having a hard time. Dylan went down in practice, as did Hanson. Dre got his face painted. He was stoked to yell “PEDAL, DIAPER FACE!!! !” at every rider coming through the rock garden. We hooked up with Cricket and Nicole and their children Jordan and Sage, along with their friend Becky, and went on up the mountain to get set to heckle. At 8am, main man Mullaly posts this to social. At first glance, I was worried he was focusing on the wrong thing. I couldn’t have been more wrong. Dylan was close to calling it on Saturday. He couldn’t stomach the thought of giving up, so he pushed through and ran on Sunday. He was glad he did. Took a conservation run and finished on the backside of the pack but got to come away with this really sick shot. Congrats on sticking with it and staying safe buddy! Hanson went down in his race in the first 15 seconds. He got up quick, unscathed and finished his run freeride-style. 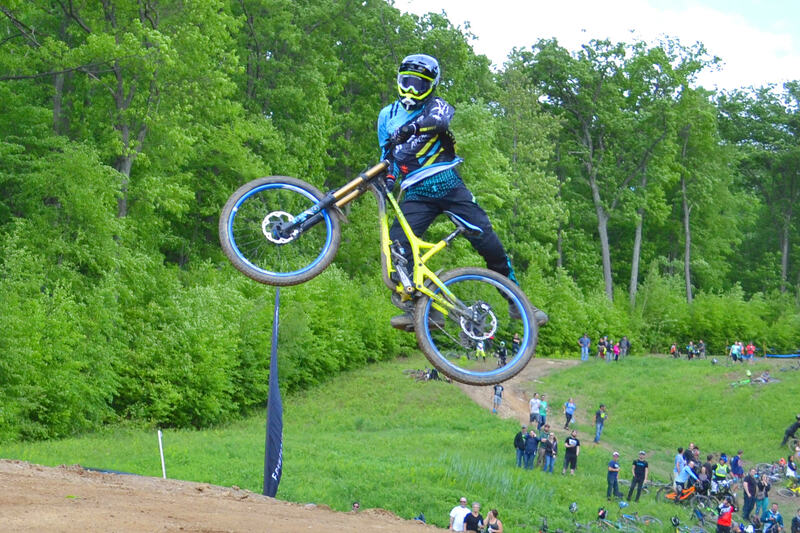 Threw a nice whip over the whip-off jump for the crowd and styled it all the way down from there. Finished back of the pack somewhere but said he had a killer time and was stoked on the second half of his run. Amy played it safe and methodical and ended up with a good seeding qual (6th place). She would finish the race in the same position, missing the fifth place podium by about 5 seconds. She said she had a bit more in her, but didn’t want to risk going down. All in all, she really killed it. Congrats on a strong finish in a stacked field, Aim. Hanson, Race Run, #Pro Line. So much fun with Dre this weekend. Riding the Greenhorn trail and chucking horns all day. So much stoke! Cricket, A Chain Saw & The Dog Handler. It was Nelson’s 30th Bday. Helping Dak Land 3rd Place Means Work.